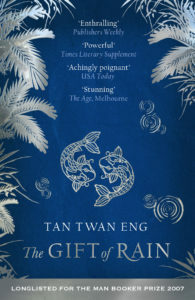 The Brown Book Club will meet on Sunday, April 14 to discuss The Gift of Rain by Tan Tan Eng (fiction, 430 pp, 2008). We’ll begin at 6PM with dinner, then go on to discussion. Please RSVP by Friday, April 12 by contacting the event organizer, who will provide location information. Mention any food allergies, and bring $6 – $8 for the meal. We previously read Eng’s The Garden of the Evening Mists. “The recipient of extraordinary acclaim from critics and the bookselling community – it was shortlisted for the Man Booker Prize in 2007 – Tan Twan Eng’s debut novel casts a powerful spell and has garnered comparisons to celebrated wartime storytellers Somerset Maugham and Graham Greene. Set during the tumult of World War II, on the lush Malayan island of Penang, The Gift of Rain tells a riveting and poignant tale about a young man caught in the tangle of wartime loyalties and deceits.